Johan Theorin is one of my favourite Swedish writers and I’ve been eagerly awaiting the fourth instalment of his quartet set on the island of Öland. The first in the series, Echoes from the Dead, was outstanding and all his writing has been of a consistently high quality. The Voices Beyond concludes the series that has as its common thread the picturesque setting of Öland and the sense of a community where secrets run deep, often for generations. It’s summer on Öland and visitors are flocking to a resort owned by the influential Kloss family. Jonas Kloss is looking forward to spending time with his cousins but one evening he stumbles aboard a ship and finds dying passengers. He tells his strange tale to Gerlof Davidsson, an elderly resident who has seen plenty of strange events on the island. One man, The Homecomer, has decided to return to the place of his birth and exact revenge for a crime decades earlier. 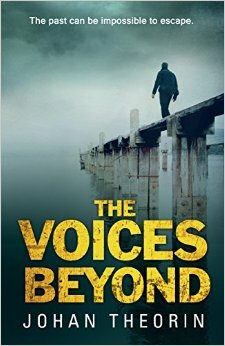 There are a number of narrative strands in The Voices Beyond. The book works best in when chronicling the story of Gerlof and his memories of past feuds on the island. The modern criminal element is also well described with, perhaps, the best character that of Lisa who DJs at the resort as ‘Lady Summertime’. Stealing from the guests to fund her addict brother’s drug habit, she’s a natural magnet for other criminal elements operating out of the resort. It’s a substantial book, at 462 pages, and the narrative tension occasionally drops. But overall the reader is drawn into the world that Theorin creates which involves, as usual, a touch of the supernatural. There’s a resolution to the murder narrative and a sense of the quartet coming to an end. The translation, by Marlaine Delargy, is very good with clear and restrained prose. Thanks to Transworld for my review copy. This is a series that I have been interested in from the beginning but haven’t read any of the books. Glad to hear that you liked them all and someday I am sure I will get to the series. Excellent review of this one. Thanks, Tracy. You’re in for a treat with this.